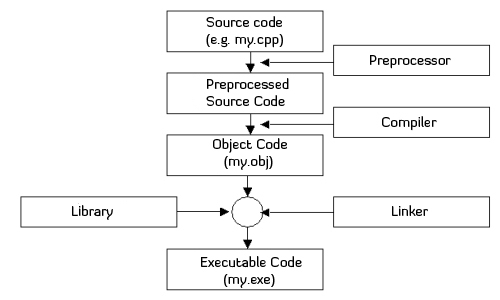 The pre-processor is a utility program, which processes special instructions that can be or are written in a C/CPP program. These instructions can be include a library or some special instructions to the compiler about some certain terms used in the program. Pre-processor directives start with ‘#’ character. From the above usage-table we can see that #include is used with two options angular brackets (<>)and inverted commas (“”). When #include is written with <> it means we are instructing to include the files from the include path defined in the compiler settings which is generally the include folder from the compiler. When #include is written with “” it means we are instructing to include a file: first the current folder is checked and if it is not found there, then the include folder of the compiler is checked. The variable declared in the header.h file will be included in main.c, so we can use the variable in main(). These are used to define macros, which are one, or more program statements (like functions) and they are expanded inline. (Expanded inline means they are substituted at the place of macro call unlike functions in which the execution pointer moves to the function definition.). //It is now	invalid to use PI, thus we cannot use the next line. Parameters are enclosed in () to avoid the ambiguity arising due to operator precedence. For instance in the example above we call SQR(4+3). This statement will be expanded as (4+3) * (4+3). Directives are helpful whenever things are prone to changes and are used at many places in one program. Changing the directive value at the top will cause the corresponding changes at all the places in the program. If the directive requires use of more than one line then it can be continued in the next line after placing ‘\’ at the end of the first line. Executing the code on different machine architectures. Evaluating codes, which are to be executed depending upon the requirements of the programmer. Note: These macros are evaluated on compile time. Therefore they can only use the predefined macros or literals. Most compilers do not support the use of variables with these directives. //We define Netherlands as country, then we get Euro. //If we define England we get pounds and so on. // If CHOSEN is not defined, then we get default. When the #error directive is found the program will be terminated and the message (that is given after the #error statement) will be used in the compilation error that is given by the compiler. #error Compilation Error: A C++ compiler is required to compile this program! The __plusplus macro is by default defined by most C++ compilers. So if this macro is not found, during compilation, then the compilation is aborted and the message (Compilation Error: A C++ compiler is required to compile this program!) is printed for the user. The #line directive is used to change the value of the __LINE__ and __FILE__ macros. (Note: the filename is optional.) The __LINE__ and __FILE__ macros represent the line being read and the file being read. For Example “#pragma inline” statement indicates the assembly code is available in the code. If the directive is unavailable in an implementation the statement is ignored. An integer that gives the line number of the current source file being compiled. A string that gives the name of the source file being compiled. A string that gives the date, in the form “Mmm dd yyyy”, when the compilation process began. A string constant that gives the time at which the preprocessor is being run. The string constant looks like “22:05:02” and contains eight characters. If the compiler cannot determine the current time, it will give a warning message and __TIME__ will be expanded to “??:??:??”. Note: the warning will only be given once per compilation. Forces the use of standard C/CPP codes only in the program. Contains a 6 digit number to indicate that the compiler is based on the standards, otherwise it contains 5 or fewer digits. This macro is defined with a value of 1 when preprocessing assembly language. If this macro is defined with a value of 1 then the Objective-C compiler is in use. This macro can be used to test whether a header file is compiled by a C compiler or an Objective-C compiler. @Zwergsocke, THX I’ve changed the copy/paste error. The __TIME__ macro is now correct!